The Downtown Line 2 (DTL2) officially started rolling yesterday. Some schools which were previously not served by Singapore’s train network like Methodist Girl’s School, Nanyang Girls’ High School and Hwa Chong Institution will now have a train stop very near their school. Anglo-Chinese School (Barker Road), another school which will now benefit from a train station being near it, is quite excited by the proximity of the DTL2 station that they have put out a huge banner outside the school to celebrate the opening of the new line. It is estimated that more than 60 percent of ACS students go to school by car. The traffic in and around the school is so heavy that the school has its own Transport Centre which manages the flow of vehicles in and out of the school. All vehicles entering the Transport Centre will be required to display a car park entry decal and each family is entitled to only one car decal. Cartoonist and former Raffles Institution teacher, Otto Fong, who was among the first to share the picture of the banner,”We can get to school on our own! Yay!” remarked, “this school is famous for rich kids and the morning lines of expensive cars”. ACS had earlier this year gotten itself into a controversy when it appeared to pressure students to sell tickets for a fund-raising carnival with a target of $300,000, saying the school would know how many tickets each boy had sold. The school eventually raised $270,000, just $30,000 shy of the target. 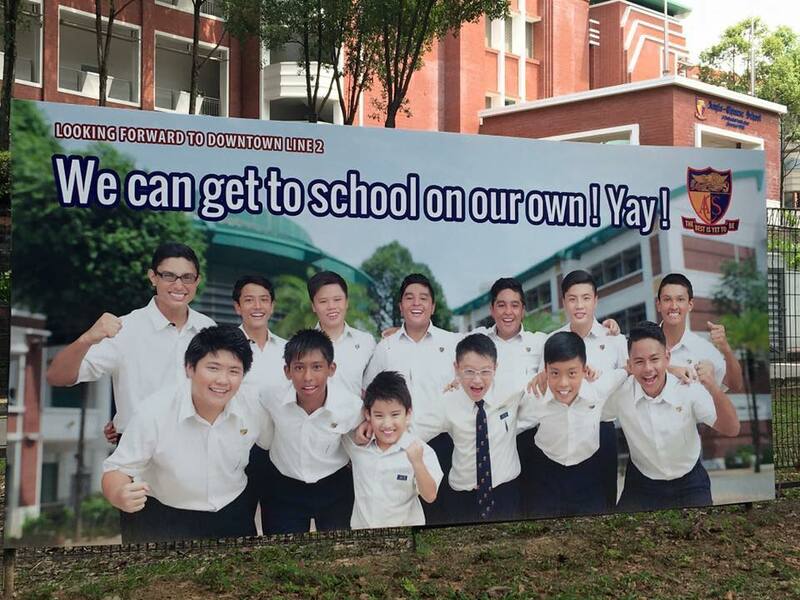 The school’s banner reminded one Facebooker of Member of Parliament, Dr Koh Poh Koon’s elitist comment during the Punggol-East By-Election, “everybody has a car, we have two. We are professionals. We need to travel”. DTL2 has certainly provided an incentive for the students of ACS to be like other good schools where less than 30 percent of students arrive by public transport. This post was edited on 28 Dec 2015.